The lake at the end of East Rosebud is abruptly bordered by mountains with contours intertwined like the legs of tango dancers. 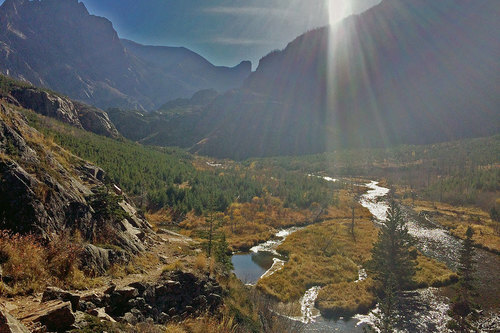 Sunlight filters through, with shadows staining each mountain with variations of black. The rumbling of the creek falling onto steep boulders can be heard in the distance, but it is a calm flow that surrounds the lake. I was there fishing on an afternoon of October. Several hours passed. In the evening a mother moose and her calf appeared in the distance. Later the bull came closer and started a staring contest. He was almost as tall as trees, with his bright horns and shiny pitch-black fur similar to a black panther. I ran away. In Montana, we are always reminded that the wild life, the landscape, and the weather tell us what to do. A humbling experience, a shift of the hierarchy, which situates us within Nature and is ever present in people’s minds; forging mentalities in the region. Nature’s overwhelming force inspires a desire to belong and blend in. Camouflage is the most common garment style, even for nightgowns and newborn’s outfits. I remember dreaming at night of becoming an animal running in the fields, while bugling herds of elks were surrounding my bedroom. Local architecture is also a kind of camouflage. Low constructions in sturdy materials, metal roofing, isolated wall panels, log or timber on occasion. The buildings follow the colors of each season. Green, brown or white. Common residential architecture does not try to be pretty, but rather to blend in and resist the environment at a low cost. Houses are built in valleys rather than hilltops, for access to water and for protection against the environment, but also not to encroach on anyone else’s view of the rolling hills and mountain ranges. Nature’s scale overwhelms the senses. Cows look like ants, trees like bushes, hills like moving sand dunes. The sky feels like a reverse ocean, and the horizon line is never straight. There is no relatable sense of scale in Montana. Driving helps. On Route 78 between Red Lodge and Fishtail, the parallax of the rolling hills moving in the foreground and the fixed mountain ranges in the distance gives better indications of relative distances. Driving in Montana is a cinematic experience that influences musical tastes. Mine changed from The Blonde Redhead to Mogway and Sigur Ross, from Schubert to Scriabin and Messiaen. Defining architecture and infrastructure for Tippet started with a study led by the international design and engineering firm Arup, a team that I led at the time with my colleague Raj Patel. Long sunny days in the summer and strong windy days in the winter define the environmental conditions, accompanied by an extreme temperature differential, poor water resources, and no power or roads. The land was marked by intensive grazing, large canyons and untouched wild-life. Everything had to be built from scratch. After two years of feasibility and concept studies, an architectural competition was launched. Four renowned firms were asked to propose architectural concepts for the center. The site and its wonders inspired highly original designs, but something unforeseeable happened. It appeared as if architecture was trying to reestablish a hierarchy between land and human habitat, as if the natural wild lost its life force once architecture became too present in it. 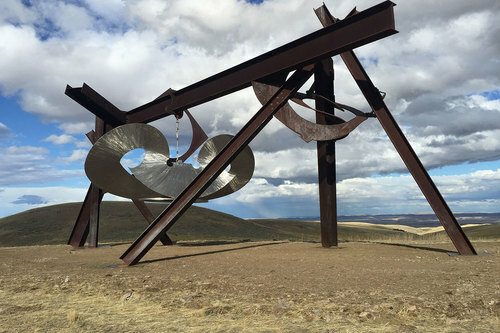 At this point, we decided to rethink the meaning of architectural interventions for Tippet Rise. The land was telling us what to do. Instead of populating the land with architecture, we moved buildings to the periphery of the property. The majority of the land was left unencumbered, available for the exploration and the exhibition of large-scale artworks offering an unlimited number of personal interpretations. The siting of each artwork was calculated so that artists could develop their own engagement with Nature. The land also influenced our taste. We started to be drawn toward raw architecture: the architecture of ruins and remains, left over from ancient civilizations, where Nature has taken back its own rights, or toward architecture made out of the land from mud or rocks, or toward agricultural structures with their indisputable right to exist on the land – each one expressing a visceral connection with Nature. 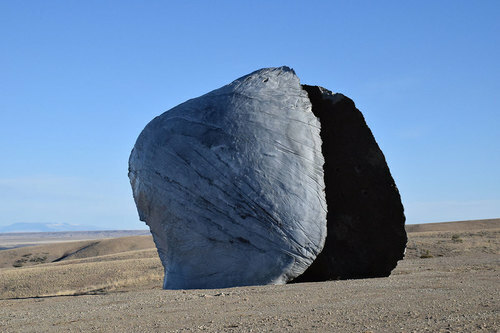 The Stones were born: three enormous concrete pieces, cast from molds dug into the ground by Ensamble Studio Architects in order to provide shelter and to suggest a narrative to the visitor’s exploration of the land. They stand timelessly, removed from known archetypes, resonating with the full geological span of the area, mythical figures calling each other across canyons. Olivier Barn, our visitor’s center and first performance space, was envisioned as a true rustic barn: a familiar form reminiscent of agricultural structures from the region. Heritage construction firm Gunnstock Timber Frames effected both the architecture and construction of the building and its adjacent artists’ residences. With geometries derived from spaces used by classic music composers for the premiere of their pieces, the building was conceived from the inside-out following the principles of acoustics, to create an intimate and enveloping acoustical space. 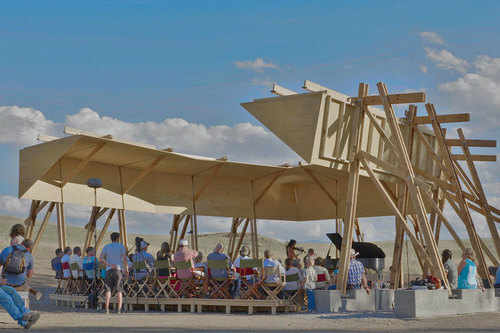 The outdoor acoustical shell, Tiara, is made from wood stanchions, recalling the timber frame of the music barn, and with plywood boards to reflect sound. The absence of walls liberates the views of the landscape, while its floating structure and corners collect the music and immerse the audience in the performance. The energy building, the nexus of all the utilities, is hidden in the ground. It is meant simply to disappear into the land, like a natural hill formation.